With Christmas and New Year out of the way, many Kiwis take the first week or two of January to enjoy the sunshine and head off on holiday. We wanted to take a look at where the top spots were around the country, and how Kiwis were spending their money on their summer roadies. This year, Kiwis spent relatively similar amounts outside of their local area compared to January last year. Total non-local spending* increased by just 0.5% for the month. Transactions outside of people’s local areas jumped 2.9% in January, suggesting Kiwis may have been having cheaper holidays than last year, by making more lower value purchases. Interestingly, spending by Kiwis did increase within their local areas, up 4.9% during January. This may mean that more Kiwis stayed home during the holiday period this year, or chose to spend their money at their local shops when they returned from holiday, and have a cheaper or shorter summer break. When looking at just the first Monday to Friday period of January both years, when most offices and businesses are closed, holiday spending dropped off even further. 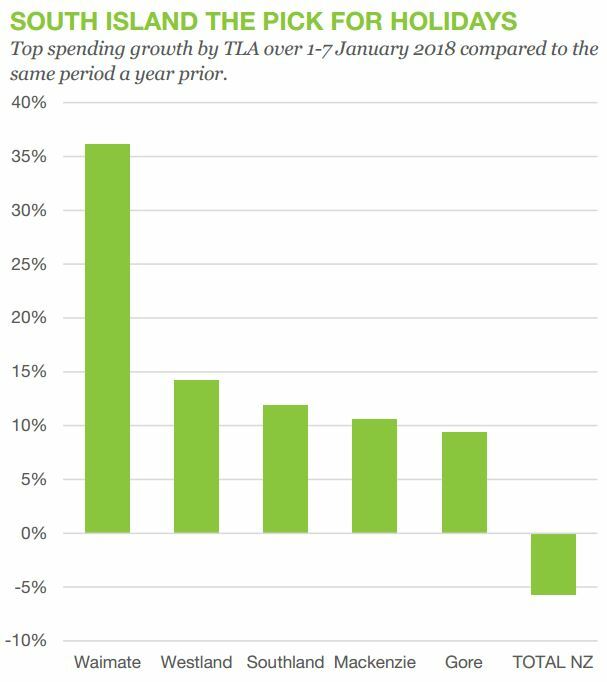 Total non-local spending over 1-7 January fell 5.7% when compared to the equivalent period last year, while transactions were down 2.5%, both figures well behind the total January non-local spending growth. Although the numbers suggest Kiwis were holidaying less, or spending less while away, there were some areas that did experience a busy holiday period. The South Island seemed to be the pick for summer holidays this year, with the top five non-local spending growth locations all in the South. The highest growth in spending by consumers from outside their local area was seen by businesses in the Waimate District, up 36.2% in the first seven days of January (it is important to note that this area has a relatively small spending base, so any changes seem more acute). Transactions in the area experienced less than half the growth of spending, up 15.1%, indicating higher value purchases. Rounding out the top five ‘holiday spots’ in the first week of January were Westland (+14.2%), Southland (+11.9%), Mackenzie District (+10.6%) and Gore (+9.4%), all experiencing non-local spending growth well in excess of the national average. Holiday periods typically see strong spending in typical ‘treat’ categories – accommodation, hospitality and takeaways some of the most common. While we did see some familiar results (takeaways were up 8.9% over 1-7 January), we did observe a bit of a mixed bag in category growth. In the first week of January, spending by Kiwis on accommodation outside of their local area was down 8% on the same period last year, and transactions were down 3.4%, both big drops for a popular holiday period. However these numbers may indicate a shift in payment preferences, rather than popularity of accommodation or holidays. With online booking options and sites such as AirBnb, many consumers are likely to be prepaying for their accommodation bookings online, prior to going on holiday (as of December 2017, Kiwi’s paid for over 40% of their accommodation bookings online). Another category with interesting holiday spending results was toy and games stores. In the first week of January, these businesses saw spending increase 17.2% on 2017. Despite the hot weather around the country, some northern areas saw heavy rainfall early in January, potentially encouraging indoor activities and new games to keep the kids entertained on holiday. While January brought hot weather to the country, it did not seem to heat up spending for holidaying Kiwis. 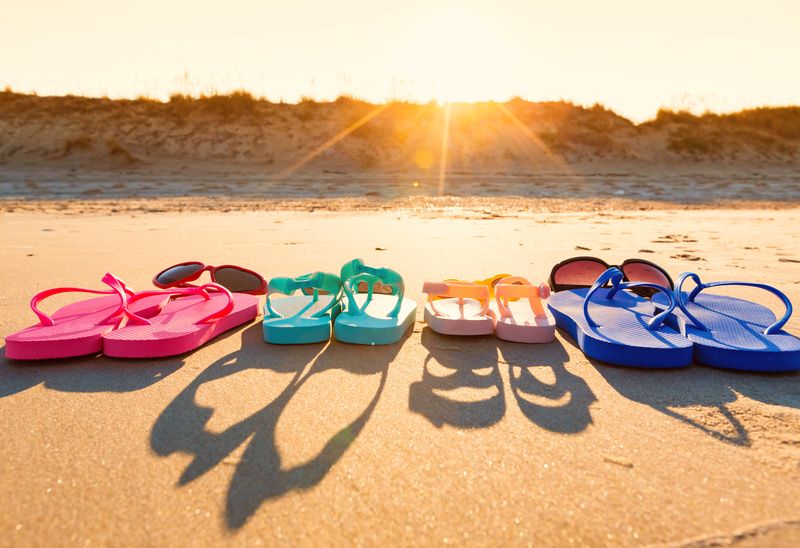 With Easter just around the corner, consumers may be waiting for the next break to splash out on a big family holiday. *For the purposes of this report, we have defined ‘non-local’ spending as purchases made by a consumer outside of their local TLA, and ‘local’ purchases as those made by a consumer within their local TLA. We have also excluded Kaikoura from our analysis, due to the 2016 earthquake impact.